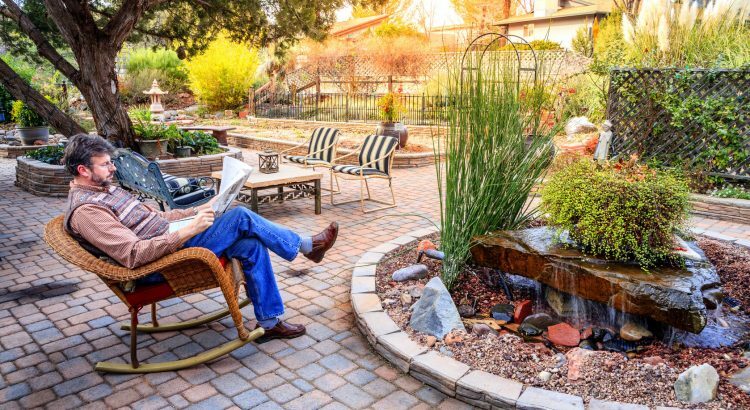 Imagine how nice it would be to kick back with a good book after a stressful day on the job, enjoying the beauty of your yard and being surrounded by nature. Below are some ideas and suggestions that you can use to create a relaxing outdoor space where you enjoy spending time. Having a private area where you can escape from prying eyes can help make your yard or garden a lot more relaxing. You can add privacy to your seating area by enclosing it with a fence made from natural materials such as bamboo or reed. These fences not only look nice but also help separate your seating area from the surrounding world. This can make the space feel much more private and secluded. When deciding on plants for your space, you should think about the overall look and feel that you want to create. Ultimately, your goal should be to create a relaxing environment. Try combining flowers that have soft colors with those that are a bit more vibrant to create a beautiful contrast. You can further enhance the beauty of the space by bringing in ferns or small shrubs. A few well-placed plants can make a real difference in how inviting the space looks and feels. You may be surprised by what a difference some flowers and greenery can make when it comes to creating a beautiful, relaxing outdoor space. Being surrounded by nature is the ultimate way to escape. Art doesn’t just have to be for the indoor and outdoor art can really add a little sparkle to an area and make it look a lot more attractive. For instance a lot of us have a patio and it can be a bit drab outdoor wall art for your patio can lighten the mood and make things a lot more colourful and exciting. Your outdoor space shouldn’t just look nice, it should also smell nice. By choosing aromatic plants and flowers like lavender or gardenias, you can add beautiful scents that further enhance the area. Best of all, these types of flowers usually attract butterflies and hummingbirds. Nothing is more fun than watching these tiny creatures as they feed on the plants in your garden. Just be sure to avoid going overboard with fragrant plants. The smells should add to the space…not overpower it. Spending time outdoors is as much about what you hear as it is about what you see. Think about the sounds that you want to bring into your space. For instance, wind chimes can create lovely background noise when there is a gentle breeze. These types of sounds can go a long way toward making the space as peaceful and relaxing as possible. Water fountains are also great for creating relaxing sounds. The sound of running water can instantly calm your mind and relax your body. The seating that you choose for your outdoor space can dramatically affect how comfortable it is to spend time there. Be sure to try out garden furniture before you buy it. You need to make sure that it not only is attractive but that it also feels good when you sit in it. Finally, make sure that it is designed to withstand the elements so you don’t have to worry about it getting damaged by being outdoors. These tips should help you create a beautiful, relaxing outdoor space. Once you are done putting it all together, you can kick back and relax in the beauty of nature anytime that you want.